1. To go backward into an earlier and usually worse condition; to recede: Jerome was retrogressing from being financially independent to having to live on the streets of his city because he lost all of his money gambling in the local casino by playing card games (poker), roulette, and slot machines. 2. To return or revert to an earlier, inferior, or less complex condition; to degenerate or to deteriorate: When Jerry refused to spend any time doing his homework and so not passing his exams, he was retrogressed from going on to the next grade level and having to take the same courses again. © ALL rights are reserved. 1. The act or process of deteriorating or declining: The sociologists noted the appearance of retrogression in the compassionate behavior of the population after the takeover of the government by right wing patriots. 2. A return to a former and to a less complex level of development or organization: The marine biologists were astonished to note the retrogression in many of the smaller life forms in their study of tidal pool organisms over a period of many years. 3. 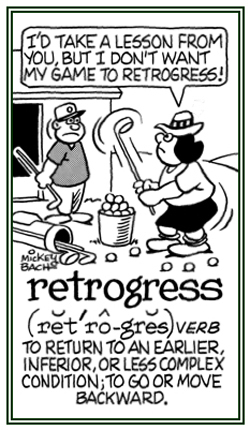 Etymology: from Latin retrogressus, past participle of retrogradi, "to move backward"; from retro-, "backward" + gradi, "to go, to step". 1. Returning to a condition or situation which is worse than the present one, instead of improving or making progress. 2. 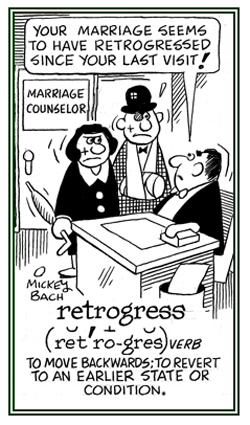 Tending to retrograde; that is, going or moving backward; declining from a better to a worse condition or situation. A solar pond that consists of three main layers; the top one is near ambient temperature and has low salt content, while the bottom one is very hot and salty and is lined with a dark-colored material. The middle (gradient) zone acts as a transparent insulator, permitting sunlight to be trapped in the bottom layer (from which useful heat is withdrawn). This middle layer, which increases in brine density with depth, counteracts the tendency of the warmer water below to rise to the surface and lose heat in the air. 1. Having feet or legs formed for leaping: The saltigrade insects are equipped to move around by jumping. 2. Moving by pouncing: One of the most saltigrade species includes a tribe of leaping spiders; such as, those that lie in wait and jump on their prey. A deterioration of materials which is produced by their exposures to solar energy. Moving slowly; a reference to sloths. Moving slowly; slow-paced; moving or stepping slowly. 1. A violation of a law, a command, or a responsibility: The contractor was accused of transgression because his company failed to provide sufficient building supplies for the housing project. 2. An offense, disobedience, or sin: Participating in Sunday labor used to be considered a serious transgression against God. A violation of a rule, or to break a law, is to commit a transgression. Showing page 7 out of 8 pages of 113 main-word entries or main-word-entry groups.